It turns out that it is possible to use multiple icosidodecahedra as building blocks to build that polyhedron’s dual, the rhombic triacontahedron. This construction appears below, in four different coloring-schemes. These rotating virtual models were constructed using Stella 4d, a program available at http://www.software3d.com/Stella.php. This “metarhombicosidodecahedron” took a long time to build, using Stella 4d, which you can find at http://www.software3d.com/Stella.php — so, when I finished it, I made five different versions of it, by altering the coloring settings. I hope you like it. In the post directly before this one, the third image was an icosahedral cluster of icosahedra. Curious about what its convex hull would look like, I made it, and thereby saw the first polyhedron I have encountered which has 68 triangular faces. Still curious, I next examined this polyhedron’s dual. The result was an unusual 36-faced polyhedron, with a dozen irregular heptagons, and two different sets of a dozen irregular pentagons. Stella 4d (the program I used to make all these images), which is available at http://www.software3d.com/Stella.php, has a “try to make faces regular” function, and I tried to use it on this 36-faced polyhedron. When making the faces regular is not possible, as was the case this time, it sometimes produce surprising results — and this turned out to be one of these times. The next thing I did was to examine the dual of this latest polyhedron. The result, a cluster of tetrahedra and triangles, was completely unexpected. The next alteration I performed was to create the convex hull of this cluster of triangles and tetrahedra. Having seen that, I wanted to see its dual, so I made it. It turned out to have a dozen faces which are kites, plus another dozen which are irregular pentagons. Next, I tried the “try to make faces regular” function again — and, once more, was surprised by the result. Out of curiosity, I then created this latest polyhedron’s convex hull. It turned out to have four faces which are equilateral triangles, a dozen other faces which are isosceles triangles, and a dozen faces which are irregular pentagons. Next, I created the dual of this polyhedron, and it turns out to have faces which, while not identical, can be described the same way: four equilateral triangles, a dozen other isosceles triangles, and a dozen irregular pentagons — again. 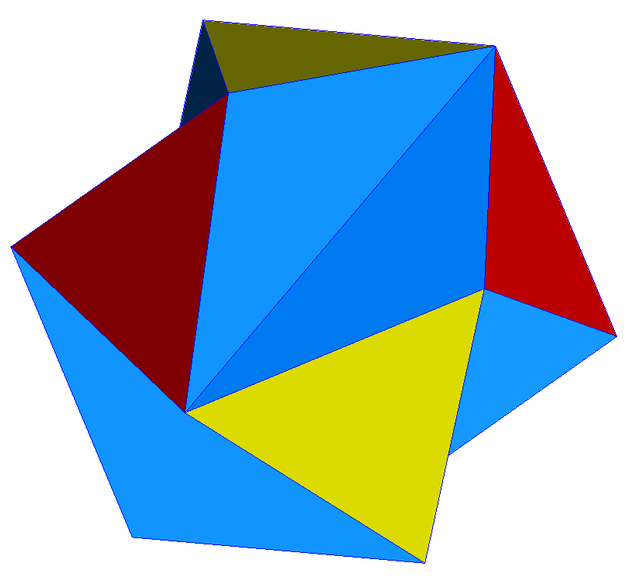 To find such similarity between a polyhedron and its dual is quite uncommon. I next attempted the “try to make faces regular” function, once more. Stella 4d, this time, was able to make the pentagons regular, and the triangles which were already regular stayed that way, as well. However, to accomplish this, the twelve other isosceles triangles not only changed shape a bit, but also shifted their orientation inward, making the overall result a non-convex polyhedron. Having a non-convex polyhedron on my hands, the next step was obvious: create its convex hull. One more, I saw a polyhedron with faces which were four equilateral triangles, a dozen other isosceles triangles, and a dozen regular pentagons. I then created the dual of this polyhedron, and, again, found myself looking at a polyhedron with, as faces, a dozen irregular pentagons, a dozen identical isosceles triangles, and four regular triangles. However, the arrangement of these faces was noticeably different than before. Given this difference in face-arrangement, I decided, once more, to use the “try to make faces regular” function of Stella 4d. The results were, as before, unexpected. Next, I created this latest polyhedron’s dual. I then created the dual of this polyhedron. The result, unexpectedly, had a cuboctahedral appearance. A single stellation of this latest polyhedron radically altered its appearance. My next step was to create the dual of this polyhedron. This seemed like a good place to stop, and so I did. The next augmentation I performed started with this tetrahedral cluster of five icosahedra, and added twelve more of these icosahedra, one on each of the blue faces of the four outer icosahedra. The result is a cluster of 17 icosahedra, with an overall icosahedral shape. All of these images were made using Stella 4d, which is available at http://www.software3d.com/Stella.php. In this icosahedron, the four blue faces are positioned in such a way as to demonstrate tetrahedral symmetry. The same is true of the four red faces. 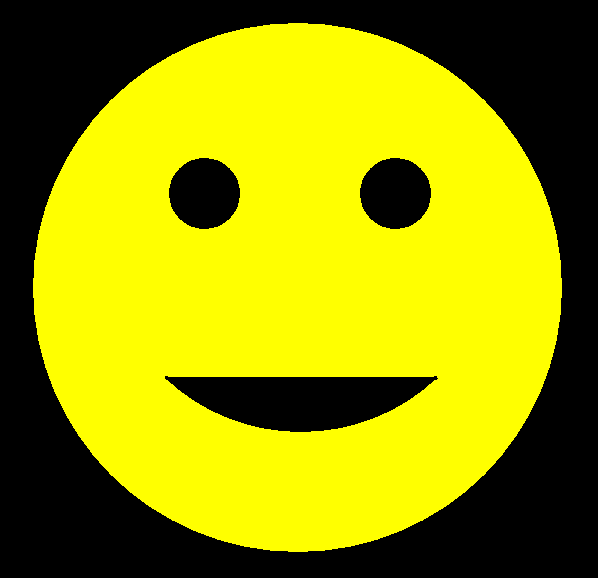 The remaining twelve faces demonstrate pyritohedral symmetry, which is much less well-known. It was these twelve faces that I once distorted to form what I named the “golden icosahedron” (right here: https://robertlovespi.wordpress.com/2013/02/08/the-golden-icosahedron/), but, at that point, I had not yet learned the term for this unusual symmetry-type. To most people, the most familiar object with pyritohedral symmetry is a volleyball. Here is a diagram of a volleyball’s seams, found on Wikipedia. Besides the golden icosahedron I found, back in 2013, there is another, better-known, alteration of the icosahedron which has pyritohedral symmetry, and it is called Jessen’s icosahedron. 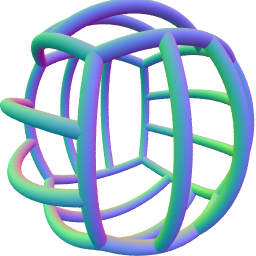 Here’s what it looks like, in this image, which I found at http://en.wikipedia.org/wiki/Jessen%27s_icosahedron. The rotating icosahedron at the top of this post was made using Stella 4d, a program which may be purchased, or tried for free (as a trial version) at http://www.software3d.com/Stella.php. This image above has only one polyhedron-type hidden from view, in the center: a red truncated cube. Next, more of this pattern I just found will be added. The next step will be to add another layer of blue octagonal prisms. And now, more yellow cubes. This was an accidental discovery I made, just messing around with Stella 4d, a program you may try for yourself at http://www.software3d.com/Stella.php. The next cells added will be red truncated cubes. Next up, I’ll add a set of pink rhombcuboctahedra. The next set of polyhedra added: some yellow cubes, and blue octagonal prisms. Now I’ll add more of the red truncated cubes. At this point, more yellow cubes are needed. The next polyhedra added will be pink rhombcuboctahedra. And now, more of the blue octagonal prisms. As long as this pattern is followed, this may be continued without limit, filling space, without leaving any gaps. At least in this part of the world, “How are you today?” — or variations thereof — is commonly used as a way to start conversations, as a bit of “small talk.” The odd part of this social convention is that, when people ask this, they usually don’t really want to hear an honest answer — or, indeed, any answer at all that isn’t part of the standard “small talk” script. The usual answer (“Fine, thanks,” or something like it) is yet another empty phrase — more small talk. Unusual answers, though, have great potential for fun. I first encountered this idea in a class I took, many years before, where the teacher told us that his habit was to answer, instead, with an upbeat, “Getting better!” I’ve tried this, and the facial expressions often seen, in response, are indeed quite entertaining. Small talk is annoying — to me, anyway — but disrupting it, by simply deviating from the usual script, can be a lot of fun. Here are some other possible answers, but this game is probably most fun if you make up your own. While I do greatly value honesty, I obviously exclude jokes from the category of lies. Also, suggestions for other funny responses, in comments, would be much appreciated.